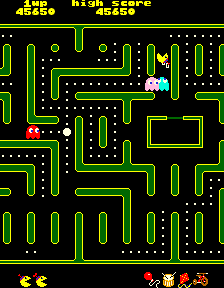 The second sequel to the phenomenally successful Pacman was released in 1983 by Midway. I personally never saw an actual arcade version of this game, but was introduced to it when it was first added to MAME. In this game you control Jr Pacman, the son of Pacman and Ms Pacman, dropped off at the Pac household by special stork delivery. Jr Pacman is distinguihed from his parents plain head and bow, by the hat stuck on his head which has a windmill attached. This rehash of the old favourite saw a couple of new twists in the game design; gone were the tunnels from the previous two incarnations. This time you were faced with a playfield which was larger than could be displayed on screen. The screen scrolls as you move around the maze to reveal the new area. The playfield size is around three times the screen's width, and fixed height. As in Pacman and Ms Pacman your adversaries are the same four ghosts but also this time the bonus items also pose a threat. 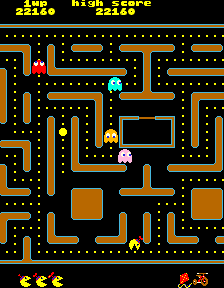 They move around the maze the same as in Ms Pacman, but this time they also mutate the dots they move over, causing you to move slower when clearing them. Also if a bonus item reaches a powerpill it will explode, causing you to be unable to use the powerpill on that maze. The level is cleared when all the dots are eaten, and every screen has a different maze to negotiate. 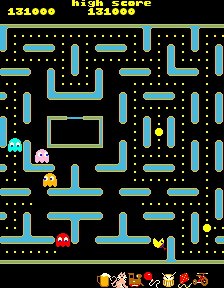 The ghosts get progressively faster with each new screen, increasing the challenge for Jr Pacman who does not. Once you reach the beer(!) level, all following screens are beer levels. Ghosts: 200, 400, 800 and 1,600 points. Difficulty can be set to normal or hard (default is normal). The number of starting lives can be set from 1 to 5 (default is 3). Extra life can be set to 10,000, 20,000 or 30,000 points (default is 10,000). On the first couple of screens, don't worry abou the bonus items moving over dots, as long as get them before they destroy powerpills. The mutated dots are worth 5 times the points as normal ones, and you can still just about outrun the ghosts on them. The bonus items have a set pattern for the powerpills they head towards, depending on which ones are still available. Learn the patterns and pick them off before they destroy the powerpills. Later levels have a lot of dead ends for you to worry about. Use the powerpills to move the ghosts away from you, and while the power is active, clear a dead end area before the ghosts return. Try to group the ghosts together when you are near a powerpill, as you get 3,000 for getting all four ghosts. On the cat and beer levels concentrate on the bonus items, as they are worth far more points than anything else.